I look like an idiot/poser with my sunglasses on (how do you cool bloggers do it?). I freaking love grapefruit juice and I could drink it everyday. Somebody buy me a juicer. Taking outfit pictures on the streets of NYC is not embarrassing at all (vs. the heart pounding anxiety I feel taking them in my own neighborhood). So I spent last week in NYC (my first visit ever!) and had a great time. I can definitely see why people fall in love with the city. I have lots of pictures to share and stories to tell, but I'm saving that for another post. For now, you get a picture of the best travel outfit I wore (all the other days were a t-shirt and cardigan combo) which really isn't all that interesting. But, the vest. You guys, it's awesome for walking around. You wouldn't believe all the crap I stuffed those pockets with: my phone, sunglasses, bobby pins, rocks from the streets of NYC, squid from Chinatown (okay, the last two aren't true, but you get the picture). I am going to NYC at the end of this month so this is perfect timing. NYC is so amazing! Glad you had fun on your first visit. Also, YAY utility vest. I am in love with mine currently. yay vest! i love vests and stripes. perf. i feel like i look like an idiot with sunglasses on lol. cant wait for more nyc posts! very cute vest and top! I saw a similar vest at Old Navy and am still thinking about it! You look great in this outfit and it's definitely walking-around-all-day-travel-appropriate. That's a thing, right? Haha! Love these pics and this is such a great outfit for touring but not looking like a tourist! Oh man you look like a legit NYC street style blogger in these pics! I love that you actually made use of the utility vest! I'll have to keep that in mind. I love NY. It is my obsession. I would move there if I didn't have a husband that wanted to stay in the south (stupid husband). I think this is the perfect roaming NY look! So cute! This is such a great outfit! I never thought of using utility vests for their pockets. *Cue the smacking of my forehead. I have bought two vests and didn't wear them so I've been afraid to buy a similar vest just for fear that I won't wear it. But then I see cute outfits like this and wish I had one. What now?? Such a cute classic look! Perfect walking around/shopping outfit. Ahh isn't NYC great?! Love the outfit and you pose with the sunglasses perfectly :) and its so funny how everyone is different because I always feel so awkward in pictures when I have my sunnies off hehe! well I think you look lovely ! love that vest ! Love it! Makes me want to go back to NYC so bad! Can't wait to hear more abut your trip! I love NYC!!!! and this is definitely the perfect NYC outfit. 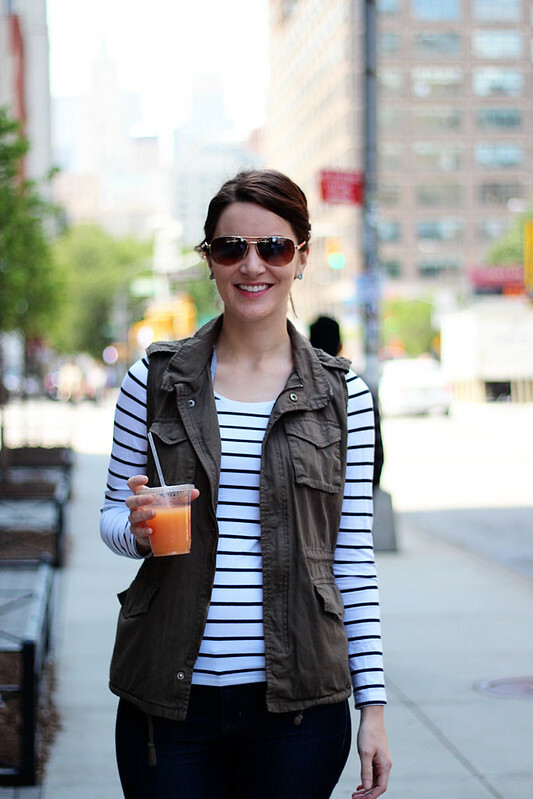 Loving your vest with your striped top! Well you look absolutely fabulous and like you belong in NYC. Not a poser at all - just adorable. Obviously I love this look. I am surprised that taking pictures in NYC is less nerve wrecking then your neighborhood though - but good to know ;) If I ever get a chance to go sans kids. I love your look, even your sunglasses! Can't wait to hear more about the trip! 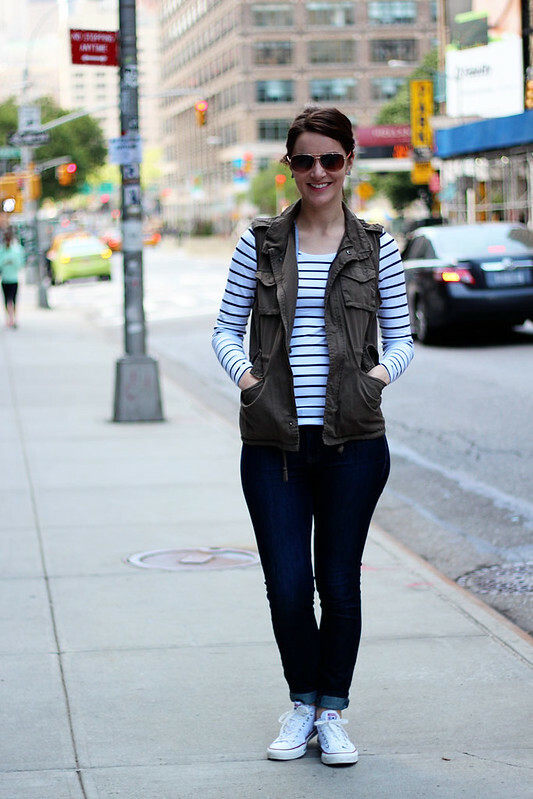 Love the stripes & vest combo! I feel like whenever there are a lot of pictures around in an already-touristy area, it doesn't feel weird to have your picture taken, right? When you're in a little suburban neighborhood, it feels much weirder. Much. You look great! I loved my visit to NYC recently and I'm glad you did too! Great travel outfit! Comfy but cute! I don't know, I feel so much more comfortable with my sunglasses on, even when I don't need them. Sort of helps to feel less awkward taking photos in public. I think this is the perfect outfit for walking around NYC. You can't go wrong with stripes! Love the striped top and the way it matches your sneakers! 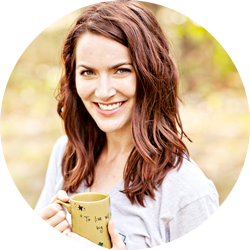 I think you look great with those sunglasses :) I really enjoy your blog so far and would love to follow each other--please join my GFC and I'll follow you right back! Super cute! Love that vest! It looks comfy and chic! Fabulous outfit and totally NYC! It's so funny, I would think it's way more anxiety-laden to take outfit shots in the middle of the busy street, but maybe with all of the tourists, it just looks like you're taking a LOT of pics of yourself on vacay? I've been to the city for trips too and while I'm so NOT a downtown person, I really do love that particular city a lot! 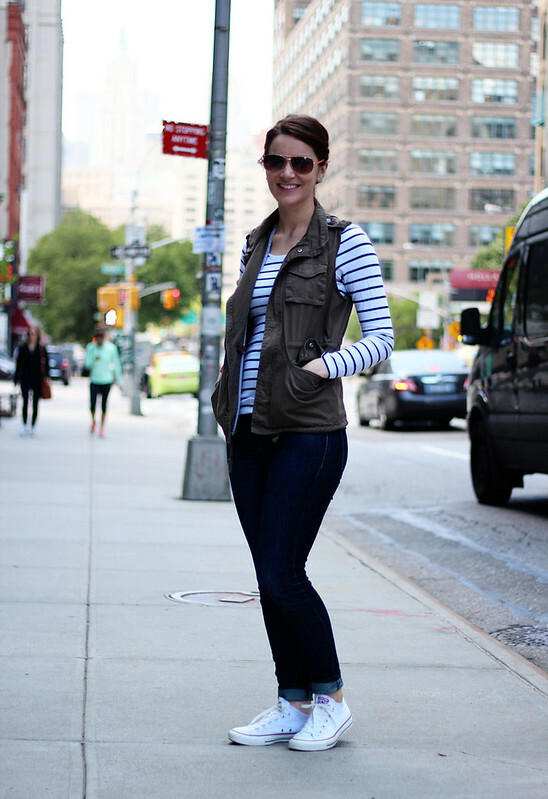 Definitely a great travel outfit and great combo- stripes, vest, sneakers- love it! Love this look!! I've been going back and fourth on getting a utility vest but I love how you styled it! I can't wait to hear all about your trip! And you look totally adorable in your sunglasses! You look great and that is the perfect travel outfit! Looking forward to reading more about your trip! This outfit is the epitome of NYC! It's mu favorite city and you look just like a local. So glad you had a great time! Your outfit is perfect for touring NYC. Stripes are always a good thing! I spent last week in NYC too! Such a cute outfit. Much cuter than anything I wore. Lucky for you it was cool enough to wear jeans. Usually when I'm there, it's boiling hot. What a comfy and chic look to wear in NYC! You look so cute with your sunglasses. Glad you enjoyed your trip! I absolutely love this outfit, and these pictures are so pretty! What a fantastic background. 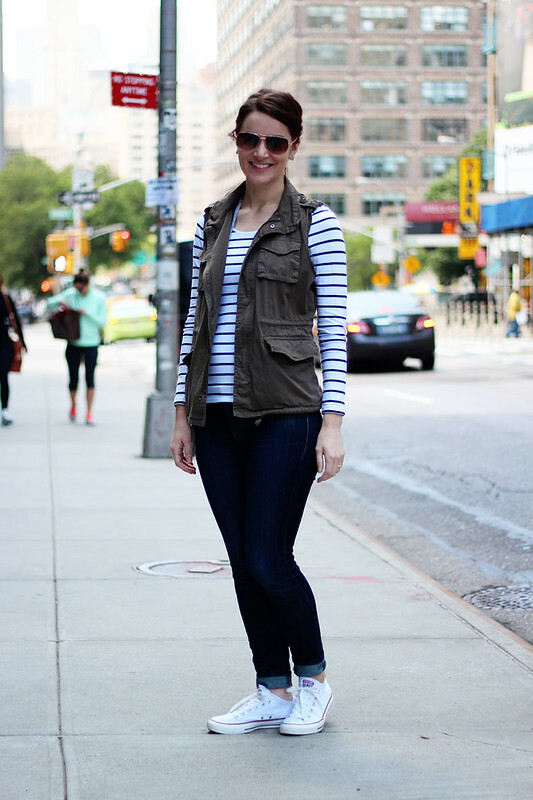 Love the stripes with the utility vest!